When traveling with baby, one important baby item to take along is a travel crib which represents a safe and comfortable place for your baby to rest and sleep while you're on the go. A travel crib is a portable folding infant bed that is easy to carry, set up and fold up. It usually comes with a soft mattress which makes the crib a comfortable and snug place for your child to sleep on a trip. Lightweight and well designed, travel cribs are perfect for both short term trips or longer travels. They are ideally suited to paying a short visit to grandparents' home as well as to longer stays away from home. But the nice thing about travel cribs is that they are so easily portable that you can also use them at home. Whenever you want to be close to your baby while you're in any room of your home and still want to be able to attend to other interests, all you need to do is bring the travel crib along, set it up in a few seconds, and have your baby safely rest or play in it, all in your company. Note that most travel cribs are only suitable for babies and toddlers that are under 3 years old. This article will compare two very popular baby travel cribs (cots) bought by Amazon customers. They are BabyBjorn Travel Crib Light and Guava Family Lotus. These travel cribs were the top sellers in their category at the time this article was written and have received excellent reviews from Amazon customers (an average of 4 star rating out of 5 stars for each of them!). You will find below a point by point comparison of the two travel cribs (cots). Selected Baby Travel Cribs on Amazon. BabyBjorn Travel Crib Light has a soft mattress, making it a comfortable place for your baby to nap or sleep. It is equipped with a built-in base plate that helps keep the lightweight crib stand firmly on the floor, so your child is always safe when asleep. The mattress also attaches to the crib at all four corners with a very simple yet original hook & loop connection. In summary, the soft yet firm mattress provides cozy comfort, while the hook-and-loop attachments allow the mattress not to move. Guava Family Lotus comes with a comfortable mattress built with a waterproof material which is softer than you might expect. 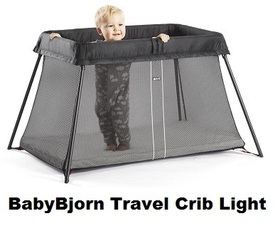 The BabyBjorn Travel Crib Light mattress does not come with a fitted sheet which needs to be purchased separately (see Amazon section below for BabyBjorn Travel Crib Light sheets). The Guava Family Lotus mattress does not come with a fitted sheet which needs to be purchased separately (see Amazon section below for Guava Family Lotus Light sheets). Open meshed side panels provide additional security by making it easy for you to keep an eye on your sleeping little one. They also provide additional breathing air to the baby. Both cribs are equipped with meshed side panels. 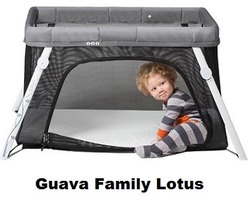 Guava Family Lotus crib has a meshed side entry that can be completely closed by zipping it up. BabyBjorn Travel Crib Light has no side entry. The advantage of having a side entry is that it gives the baby more room to move around, and the toddler the freedom to get in and out (under your supervision of course). This provides the toddler with more interest to spend time in the crib which becomes like his or her little own world with less of a feeling of limitation. The BabyJorn travel crib is offered in three colors: black, silver and blue. 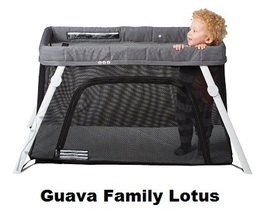 The Guava Family Lotus travel crib has a mixed color setup: it's gray along the top, has black mesh sides, a white mat as well as white legs. Because the Guava Family Lotus crib has a side entrance, it can be kept open while the baby is playing, so he or she can have more space to move around. Both travel cribs are made of safe non hazardous materials and are certified by the proper child safety organizations. So which of these two travel cribs is best for you? First, if you have watched the above videos, you would have seen clearly that BabyBjorn Travel Crib Light and Guava Family Lotus are both easy to set up. This is because, all parts, including the legs, are already built into the crib, and all you have to do is deploy the unit in a couple of seconds. Second, Guava Family Lotus is equipped with zippered side panels that can be opened up for side entry. The advantage of having a side entry is that it gives the baby more room to move around, and the toddler the freedom to get in and out, under your supervision of course. This provides the toddler with more interest to spend time in the crib which becomes like his or her little own world with less of a feeling of limitation. This feature is not available on the BabyBjorn Travel Crib Light. 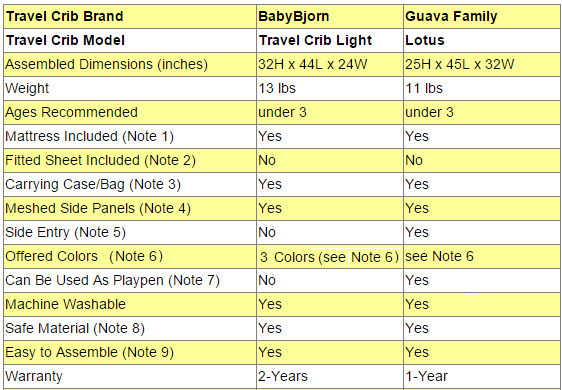 Finally, note that BabyBjorn Travel Crib Light comes with a 2-year warranty as opposed to 1-year for Guava Family Lotus. You will find below both travel cribs compared above as well as fitted sheets for each of them. ​Please click the travel crib of your choice below for price information or to purchase.